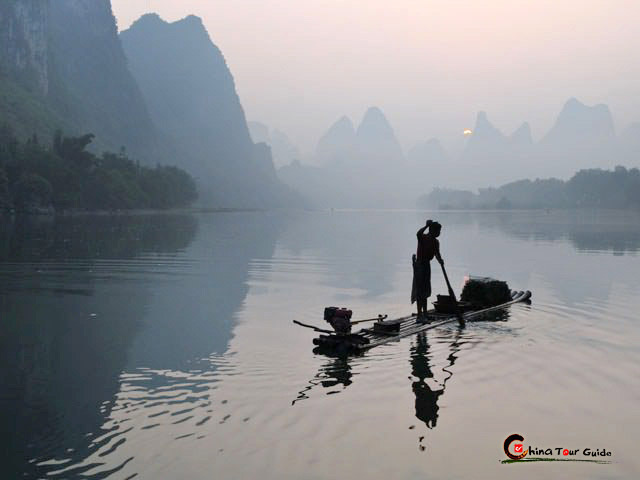 Moon Hill, located eight kilometers (five miles) south of the town of Yangshuo, is the most well-known attraction in Yangshuo. It is a popular to rent a bike in town and then ride out for a pleasant morning hike up the hill. A strange geological formation at the top is a massive arch with a hole in its peak through which the sky can be seen like a full moon, hence the name. A flight of more than 800 steps winds its way up to the top of the hill. This is called 'Appreciating Moon Path' since a traveler walking along the winding path can see the sky through the hole from different angles, sometimes appearing as a full, half or crescent moon. Natives from moon-hill village at the hill 's foot offer drinks and attractive souvenirs while the small village is itself a charming sight. 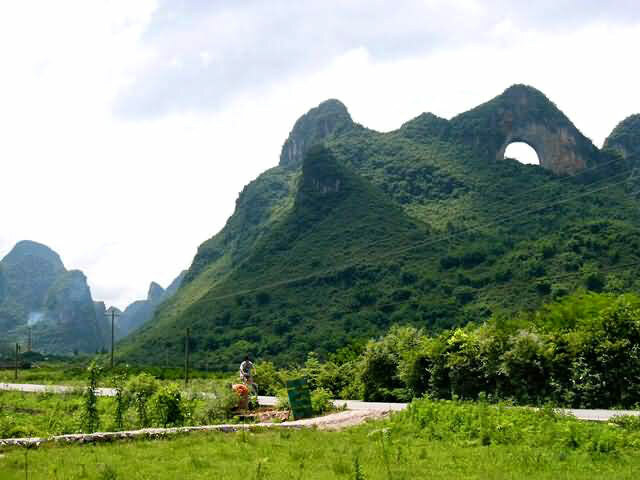 Moon Hill is also known as "Bright Moon Peak", as there is a 50-meter (164 ft.) wide tunnel on the top of the hill that looks like a bright moon when the night falls. After climbing about 800 marble steps, you will arrive at Moon Cave which is full of stalactites of various shapes, some like Buddha warrior attendants, some like jade rabbits, and some like the goddess of the moon. The cave itself is reminiscent of the moon palace of traditional Chinese legends. If you really want an adventure you can hike up further beyond the marble steps along a natural, winding, and sometimes steep path to the very top of the arch. On the top of the arch it feels as if you are on top of the world. A cool breeze blows refreshing tired climbers. The view from the top is magnificent and definitely worthy of the trip. It 's a photographer 's paradise with "gumdrop" mountains, snaking rivers, green fields, and village houses stretching out to meet the horizon in all directions.experience.